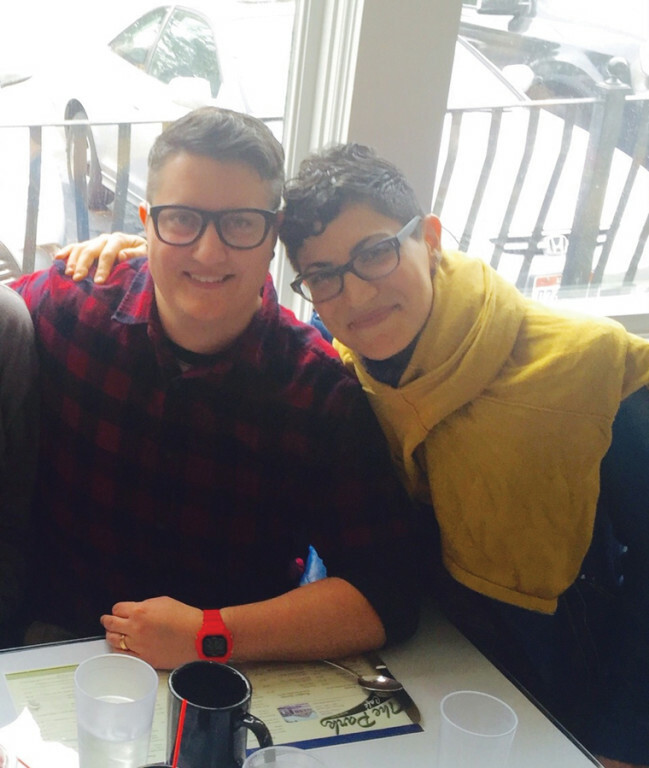 Queer, Person of Color, or Low-Income; Is Cohousing Possible for Me? 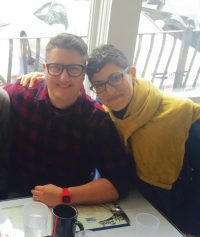 Pictured: Aitch Muirhead and Shira Frank, a trans man and his spouse, who live at Wasatch Commons in Salt Lake City. The predominant demographics of American cohousing communities are pretty clear: white, middle or upper middle class income and background, educated, liberal, with a strong tilt towards older folks and older women. There is a small sprinkling of non-white people, but very few are African American, Latino, Native American, or Asian. What are the realistic options for people who are interested in cohousing but don’t fit the typical profile? My experience has been positive, but I have only one mild strike against me, and in a liberal pool, it’s barely a strike. I’m a lesbian. Birds of a feather flock together. LGBT folks have created their own intentional communities for decades with need for safety and support (see www.ic.org/wiki/queer-community). In North Carolina, Village Hearth Cohousing (www.villagehearthcohousing.com) is forming for LGBT folks and allies. The current planning group is an all-lesbian group of older women. As the US has become more gay-positive, most cohousing communities pride themselves on LGBT acceptance. My only complaint at Columbia Ecovillage (columbiaecovillage.org), where I live, is that I feel invisible. There are so few of us queer folk and our rich history as a minority subculture is lost in the homogeneity of our largely heterosexual community. Most of us LGBT folks are older, which means we grew up in a more closeted, conservative era and are not on the cutting edge of queer culture. Aitch Muirhead (theadventuresofaitchalexandar.com), a young transitioning man who lives with his wife at Wasatch Commons (content.csbs.utah.edu/~ehrbar/coho) in Salt Lake City, has felt accepted during his transition from woman to man and the couple are happy to be living in a supportive community. If we queer folk were half our communities, however, and if more of us openly challenged traditional gender and sexuality norms by refusing gender pronouns or practicing polyamory, there would likely be negative reactions or concern. In general, though, cohousing culture seems to be a safe place for those of us queer folk who can afford to join! I do otherwise fit the cohousing profile: middle class, educated, liberal, and 64 years old. I am not a person of color nor am I poor. If I were, I would face almost insurmountable barriers to living in cohousing today. Cohousing communities are increasingly concerned about their homogeneity, but seem pretty much stumped on what to do, particularly when it comes to race and ethnicity. Why do people of color not typically join cohousing planning groups nor purchase or rent in cohousing? When Diane Leafe Christian, a leader in the cohousing movement, queried how communities are responding to this challenge in a National Cohousing Association blog post (www.cohousing.org/node/1672), it looks she didn’t get any replies. She was of the opinion, however, that cohousing communities are “welcoming” to people of color. Tavi Baker, who works for the Boys and Girls Club of San Francisco and is one of several organizers of the The People of Color Sustainable Housing Network (www.meetup.com/People-of-Color-Sustainable-Housing-Network), would likely disagree. Baker has experience living in cooperative housing and attended meetings of the East Bay Cohousing network to consider cohousing, which is predominantly white. She left, she says, to join other people of color to set up the POC Network and to plan their own communities. “I was tired of being the only one in the room,” Baker says. Mainstream cohousing organizations tend to reproduce the same unequal power relationships that exist in society, says fellow organizer Deseree Fontenot, who is in the process of getting a masters degree in Social Transformation. POC Network organizers agree that cohousing and other communities must engage and provide a “point of entry” for people of color from their beginnings and must focus not only on sustainability and community, but also on activism and social change—including being willing to share power. And, they say, people of color will not be drawn when they are a tiny minority in a white cohousing community. Without a critical mass of racial and ethnic minority representation, many interested people of color will not feel truly welcomed, no matter how friendly cohousing planners might be. We liberal white folks are often unaware of our own attitudes and subtle behaviors when it comes to race and class. We typically lack personal connections to and within minority communities. We are often blind to our privileges and are not able to put ourselves in the shoes of someone who is racially or ethnically different, surrounded by white people. And we easily forget that people of color continue to be economically disadvantaged and targeted. Some cohousers like Zev Paiss, a former Executive Director of the Cohousing Network, have theorized that people of color may not have the same need for intentional community as white folks do (www.ic.org/wiki/desire-diversity-cohousing-perspective). The POC Network organizers disagree. “There is a rich history of intentional communities developed by people of color,” says POC Network organizer Lina Buffington, an organizational consultant and activist with a Ph.D. in Philosophy. African American farmers were the first to use land trusts in the South. The Black Panthers created a variety of communal housing groups. The MOVE activist community in Philadelphia lived communally. Most of these efforts, she says, were systematically destroyed by the white establishment, but all were engaged in social justice work. In the Bay Area there is clearly a high interest and demand among people of color for intentional community. The need is especially critical in Oakland and the Bay Area in general due to gentrification and extreme increases in housing costs. The POC Network, launched in February 2015 as a Meetup group, already has 140 members with 450 friends on Facebook. The Network’s aim is to create and support the development of POC-centered sustainable communities, with an eclectic, connected network of alternative housing and organizing communities in the area. Options could include cohousing, land trusts, bedroom rentals, large shared houses, accessory dwelling units, and more rural communities with existing or new construction. Cohousing communities today are typically not focused on issues of poverty, racism, sexism, immigration, LGBT or other community justice issues. In contrast, the POC Network’s projects will emphasize social change activism by and among residents, with organizing centers and mutual networking and support. The leaders are themselves activists, and say that without this focus, people of color are unlikely to be attracted to cohousing communities. The POC Network organizers report that they have drawn a racially diverse group of folks, including a significant number of LGBT people. Although the majority are in their 20s to 40s, the network hopes to draw an intergenerational community of participants. Currently their focus is to build infrastructure by raising funds for staff. Current projects include helping to develop two three-acre communities in East Oakland and El Sobrante using a land trust model. This model would allow communal land use that is affordable for low-income families in perpetuity, protecting residents from the vagaries of the housing market and economy. I trust that this Network will be a catalyst for communities of color, at least in urban areas with high diversity and activism. I have doubts, however, that the current mainstream cohousing world will begin to attract more people of color without a significant shift to social justice aims and activities, and without better addressing issues of privilege and affordability. The good news is that affordability is a hot topic within the cohousing world. Communities are very focused on environmental sustainability, and build or remodel housing units using green, high-cost technologies. Large properties with significant communal structures require higher prices. Many cohousing communities have various limits on the number of rentals permitted. Cohousing tends to be concentrated in urban areas with high housing costs in general. And because of the concentration of older residents, there is sometimes conservative resistance to non-traditional housing arrangements which may cost less. Creative solutions are beginning to emerge, with some good results. Within the constraints of local housing regulations and available affordable housing programs, communities are expanding affordable options, including government-subsidized units, shared housing, and construction and rental of small accessory buildings. At The Commons (santafecohousing.org) in Santa Fe, 11 casitas (little attached homes) were constructed next to their larger, more expensive homes to provide lower-cost rentals. At Sand River (www.sandriver.org) in Santa Fe, a seniors-only cohousing community, a partnership with a local affordable housing program permitted the construction and sale of several lower-cost homes. Troy Land and Gardens (www.communitygroundworks.org/what-we-do/troy-land-gardens) in Madison, Wisconsin uses a land trust model to create a majority of income-restricted homes. And the nonprofit Partnerships for Affordable Housing (www.affordablecohousing.org/home/mission) is working nationally to support the development of affordable cohousing options for low- and moderate-income residents, with a mission that includes empowerment of tenants and greater involvement in local community social justice goals. As a person who has worked in social and empowerment services my whole life, I continue to feel ambivalent about the concentration of whiteness and relative wealth in cohousing. But if I were still living alone in a single family home, would I somehow have more integrity? Not really. I have to be honest that I am flocking with birds of my feather, and that I prefer communal living to solitude, no matter what social justice values I may find missing from my community. It’s my own responsibility to promote these values within and without the fences of my ecovillage, and to help create the kind of community I want to see. Cynthia Dettman is a lesbian and retired community college counselor who moved in to Columbia Ecovillage in 2014 and has not looked back. She worked as a legal aid attorney and later coordinated empowerment services for low-income women at Mt. Hood Community College. In retirement, she is writing about social justice issues, working on a novel set in South India where she grew up, teaching college success classes, and cooking gourmet meals for her cohousing community.